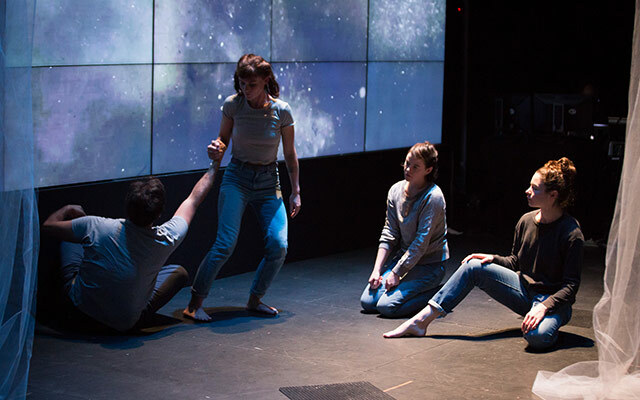 UC San Diego graduate students in choreography, visual arts and music composition perform Cetacea, a multimedia work that premiered during the 2017-2018 IDEAS performing arts series at the Qualcomm Institute. The call for proposals for the 2018-2019 IDEAS season is now available online. All proposals must be submitted no later than November 5, 2018 at 11:59 p.m. through the online submissions form. The Qualcomm Institute is the UC San Diego Division of the California Institute for Telecommunications and Information Technology (Calit2). The winning events will be staged and/or presented in the institute's high-tech venues in Atkinson Hall on the UC San Diego campus. Proposals will be judged on the quality of each submission; the proposed impact of the critical engagement; the extent to which the artist proposes to use Qualcomm Institute’s unique audio, video and performance space; the multidisciplinary nature of the work; and the general relevance of the work to the IDEAS mission for digital exploration of arts and sciences. All performances and presentations will be open to the public and free of charge. IDEAS was launched in 2013 to encourage UC San Diego artists, technologists, and scientists to take advantage of the Qualcomm Institute's advanced audio-visual facilities, services and personnel in developing and staging interdisciplinary new or existing works. Submissions undergo a rigorous peer review by the IDEAS Program Committee, which is composed of faculty and graduate students. Preference will be given to multidisciplinary submissions that take maximum advantage of the Qualcomm Institute's unique combination of visual and audio technologies, as well as its internal and external spaces for performances. Final decisions will be conveyed to applicants in December 2018. The latest call for proposals seeks submissions for in-kind support from the Qualcomm Institute's IDEAS program for the development and staging of performances involving new or existing works. The in-kind awards will support facility and equipment usage, including lighting, visualization and sound systems, as well as audiovisual technicians and other personnel for event, promotion and communications. Onsite residencies may be awarded from a single day to a full week, depending on project scope. For more information about the IDEAS Performing Arts Series at the Qualcomm Institute, visit http://ideas.calit2.net.